Here we have the leader of a party that aspires to playing a role in the next government calling Gore a phoney and fraud. I wonder why he didn’t mention that Gore’s fat? So what is ACT policy on climate change? I went digging. The proposed Emissions Trading Scheme (ETS) is under intense scrutiny at the moment. Lobbyists, economists and politicians are all pounding their respective beats, and as is usual in these matters, a great deal more heat than light is being shed on the proposed legislation. At the beginning of the week, the government’s climate change leadership forum – the great and the good of the business world – announced that it supported the broad outline of the ETS with some caveats (announcement, Herald), only for Business NZ to promptly withdraw its support. Then the Sustainability Council of NZ published a report [PDF] criticising the way that the ETS transfers revenue from consumers to key industries – especially agriculture – and warned that it wouldn’t do enough to reduce emissions. 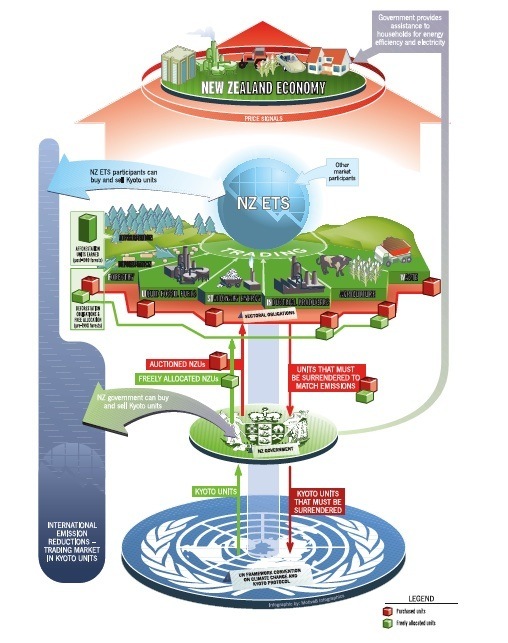 Not to be outdone, the NZ Institute for Economic Research produced its own report [PDF], warning that the scheme would do little good and cost the economy billions, and advising that we shold do nothing except buy Kyoto compliance on the world market. ACT leader Rodney Hide then announced that “the Government’s ETS is a crock and should be dumped.” There are now rumours that the government is running scared, and might delay implementing the petrol and fuels part of the scheme to avoid frightening consumers in the run up to the election. So, who’s right? Is Rodney’s incisive analysis on the money?